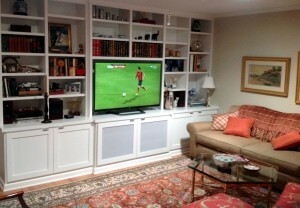 A setup of audio and video equipment in your home that tries to duplicate the movie theater experience. A system of sophisticated electronic equipment for the presentation of theater-quality images and sound in the home. These descriptions are misleading because a home theater is NOT a system of equipment. We believe it is a room that immerses you in a sight and sound experience that takes you to another place; the place the film maker intended when he or she created the film. 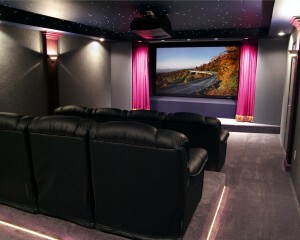 A home theater may be a dedicated room or a multi-purpose room. Either way, our home theaters are offer a better experience than even the best, local “too-many-plex” theaters. We will work with you to create that experience in your home that fits your decor, style, and budget. Take a look at some photos of both formal and inform home theater systems we have designed and installed for our clients by going HERE. Call us to discuss what you would like to accomplish, our advice is free and people tell us we are fun to talk to! This non-traditional living room theater delivers the sight and sounds intended by the film maker. A dedicated home theater with the traditional seating and decor.